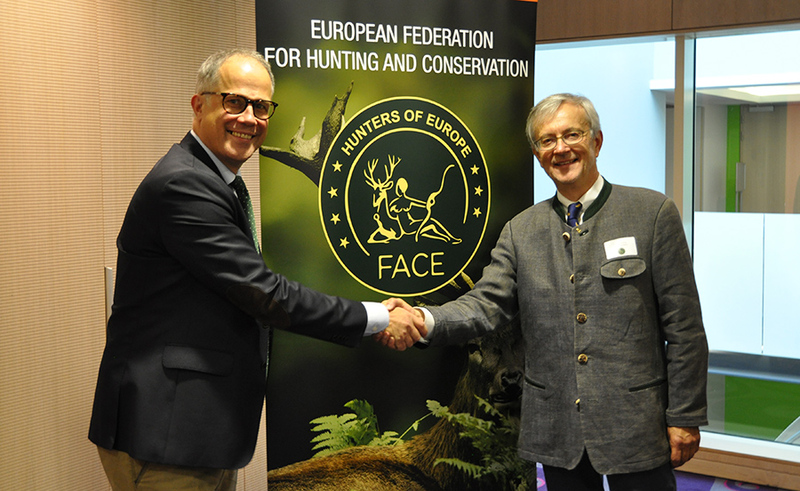 Brussels, 6 September 2018 – During its 52nd General Assembly on 5 September 2018 in Brussels, FACE – the European Federation for Hunting and Conservation – elected Torbjörn Larsson as its new President and appointed a new board. In his address to FACE Members, Torbjörn Larsson stated: “I want the coming presidency to be about the future. 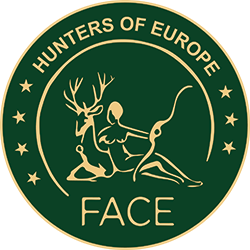 FACE has four decades of proud work and victories in the service of its member organisations and Europe’s hunters – but the coming four decades will be entirely up to us sitting here. FACE is as strong as its Members and what the Members make of it”. Mr. Torbjörn Larsson was unanimously elected as the new President of FACE by the delegates of the European hunting associations. Torbjörn Larsson has a long background in dealing with a diverse range of issues related to hunting and conservation. He is currently the President of the Swedish Association for Hunting and Wildlife Management (Svenska Jägareförbundet). Prior to that he served as a regional president for five years; for eight years, he was a member of the national board and became responsible for international affairs, closely following the work of FACE. Torbjörn Larsson will leave his current position as President of the Nordic Hunters’ Alliance, elected in April 2018, to accept the new challenge as FACE President. Announcing his strategic goals for his Presidency, he stated: “A first priority of my Presidency will be a review of FACE’s focus and objectives”. He also stressed the importance of: “Solidarity between Europe’s hunting regions to preserve and promote Europe’s unique hunting cultures. The Members’ diversity is one of our greatest strengths. We are diverse but united in our passion for hunting, shooting and conservation”. The newly elected FACE Board is composed of nine Vice-Presidents: Dr. Volker Böhning (Germany), Gian Luca Dall’Olio (Italy), Christopher Graffius (United Kingdom), Claus Lind Christensen (Nordic Region), Linda Dombrovska (Baltic Region), John Flannery (Atlantic Region), Lino Farrugia (Mediterranean Region), Dragan Šormaz (South-East Region) and Srečko Žerjav (Central Region). Dr. Laurens Hoedemaker was elected as the new Treasurer General. Outgoing President, Dr. Michl Ebner, had announced his wish not to continue his presidency, thanking all FACE members for their support during the last three years. He wished them continued success in representing common interests for hunting at the European level. 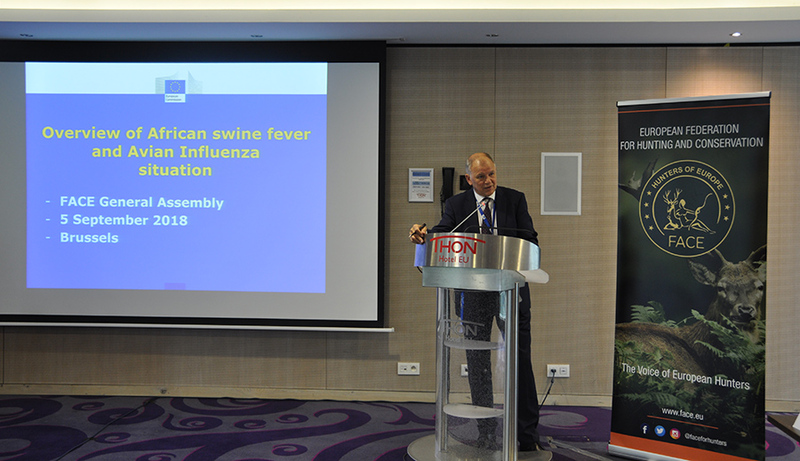 During the FACE General Assembly, the EU Health and Food Safety Commissioner Mr. Vytenis Andriukaitis acknowledged his strong support for the role of the European hunting community in wildlife conservation and combatting a range of serious animal diseases, especially African swine fever in wild boar. FACE also welcomed Dallas Safari Club as a new associate member.